Not much time, right? But that’s how long you have to catch a buyer’s attention when selling a home. So, you’ve got to make those seconds count from the moment a prospective buyer arrives on your property. It’s not just about selling your home quickly. It’s also about fetching the highest price possible. Properties that look nice and smell nice inevitably sell for more money than comparable homes with cluttered closets, dishes in the sink and dandelions speckling the front lawn. So, how do you get your home ready for a potential buyer? Here are some tips that will help you make a good first impression. Curbside appeal: Believe it or not, the cleanliness of your street and sidewalk matter when it comes to selling a house. Keep the pavement in front of your house free of litter – even if it takes a sweep – and remove any weeds that may be growing up through the cracks of your sidewalk. 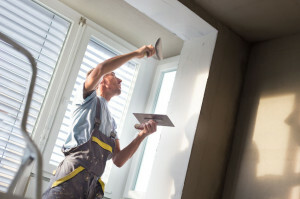 Fresh paint: Even if you don’t want to spend the money to paint the entire house, there are a couple places that will pay off in dividends if you can afford a few gallons of paint. When it comes to making a good first impression, there’s no better place to start than with the fence. Give it a fresh coat. You should also think about the front door, shutters and even lamp posts to send a message that you care about details. Landscaping: No buyer will be impressed by an overgrown, or weed-infested, lawn. Keep the yard looking nice in the spring and summer by mowing the grass, weeding flower beds and clipping any hedges. Take time to prepare your yard in the fall. And in the winter be sure to keep your driveway and sidewalks clear. Lighten up: Make sure your house looks as bright as possible. Light is a proven seller. So keep the windows clean, replace any burned-out light bulbs and even use mirrors to help magnify the feeling of light and space. Color scheme: Although you may enjoy decorating in orange or lime green, avoid those colors when selling. Look for neutral colors that allow buyers to better picture themselves in the home. Clean, clean and de-clutter: Make sure your potential buyer isn’t distracted by a gallon of milk on the counter, dust bunnies beneath the couch or knickknacks piled high on your shelves. Focus on making your home look big, clean and desirable. Does that help? If you have any questions, don’t hesitate to call.